The Site Scan Manager is a great way to keep track of all your Projects and has many useful tools that allow you to streamline your workflow such as the ability to share information and results with colleges and clients, monitor your site’s progress, process or merge Flights directly from the manager and even extract useful data such as volumes, areas and distance measurements with out the need of 3rd party tools and software. To visit the Site Scan Manager visit the following link and use your Site Scan credentials to log in. Once you log in you can start by choosing what Project you want to work on. To do so you can either select from the secondary menu on the left hand side of your screen. You can also click on the “Projects” tab. This will open a new window allowing you to choose among your existing projects. To open a Project simply click on it’s name. You also have the ability to edit a few key point. To do so mouse over the name of the Project you want to edit. This will prompt a pencil icon to appear next to it. 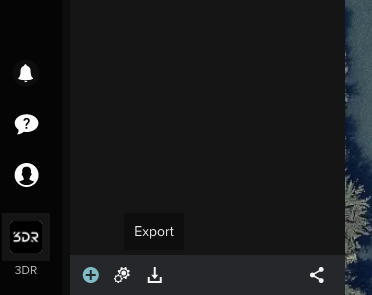 Click on it to open the Edit Project menu. Within this menu you can edit the name of the Project by typing it in withing the “Project Name” window. You can change it’s location by typing it in within the “Project Location” window and it will auto fill it as you type. You can also edit the “Unit settings” by selecting the ones you want to have used from the drop down window. 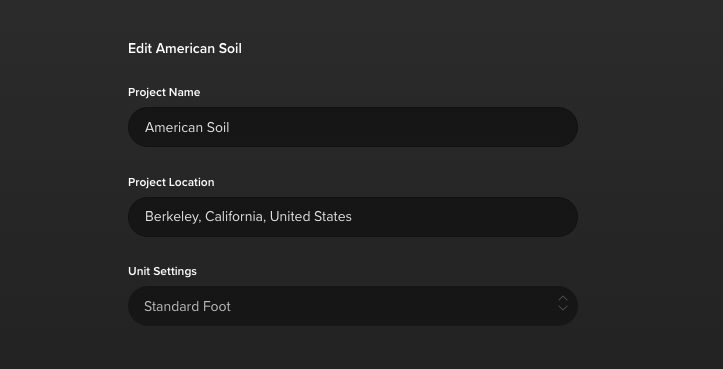 You can choose between Meters, Standard Foot and U.S. Survey foot. After you finish editing the project click on the “Next” to push the changes through. For now we won’t change anything on the Project. We’ll go ahead and select the one we want from the drop down menu. Once you do, you’ll be able to choose between all the Flights within that Project. Flights are arranged by date (you can see the date right underneath the name). If it’s already been processed, click on the toggle next to “Orthomosaic” to overlay it on the base map. You can also click on the Name of the Flight at the top left to open a drop down menu to select between all the other Flights within this Project. You have the option to view them as a dropdown list or in a calendar. If you have any Flights that haven’t been processed yet click on the “Process” button in the bottom left corner. 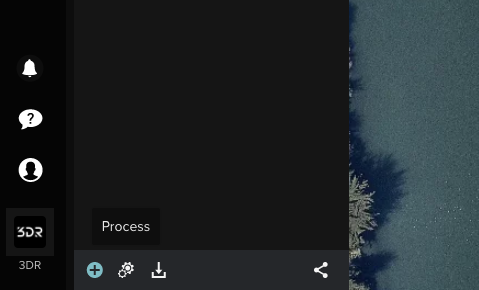 There will be an indicator next to the “Orthomosaic” toggle in the form of a loading icon. 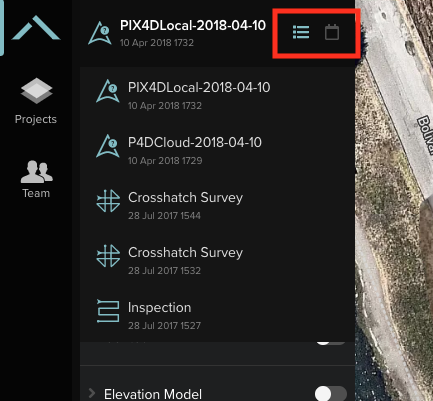 Once the processing is done you can download the resulting files by clicking on the “Export” icon in the bottom left corner and selecting the file you want to download from the export menu. There are other icons and indicators within the Site Scan Manager that have different functions. The Active Processing indicator only appears while a Flight is being processed. This icon indicates that the processing phase hasn’t finished. The Crosshairs icons allow you to travel on the map over to the job site. This can be done through any of the layers/data products or with the resulting Orthomosaic file after the processing has finished. The Toggle map on/off icon allows you to hide the base map. This is useful when presenting the resulting Ortho file while not having to disclose the location of the job site. 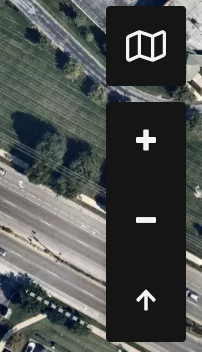 The Zoom level on the map can be controlled using the plus and minus icons. The Map heading icon right underneath indicates the heading of the map. By clicking it the heading changes back to the default which is North. Once the processing is done, You can access the Export link of the different resulting files Site Scan offers. Each of them has a specific purpose and advantages. Ortho (.tiff): This is the georeferenced orthomosaic map of the flight area. 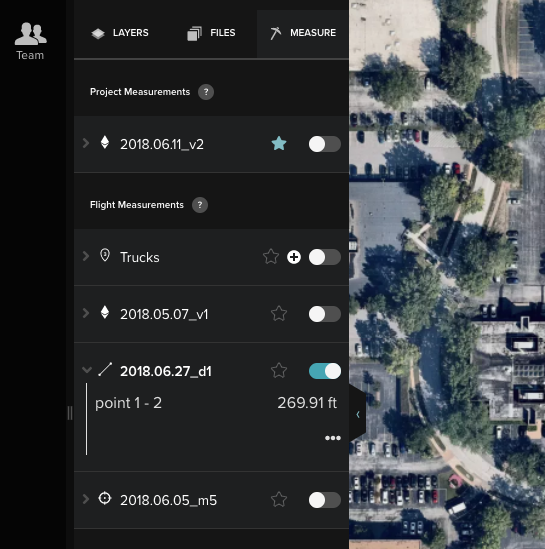 Orthomosaics can be opened and manipulated in Google Earth Pro, ArcGIS, QGIS, AutoCAD Civil 3D, Infraworks, and many other GIS programs. DEM (.tiff): This is the georeferenced Digital Elevation Model associated with the orthomosaic. The value of each pixel corresponds to an elevation above ground. DEMs can be opened and manipulated in Google Earth Pro, ArcGIS, QGIS, AutoCAD Civil 3D, Infraworks, and many other GIS programs. 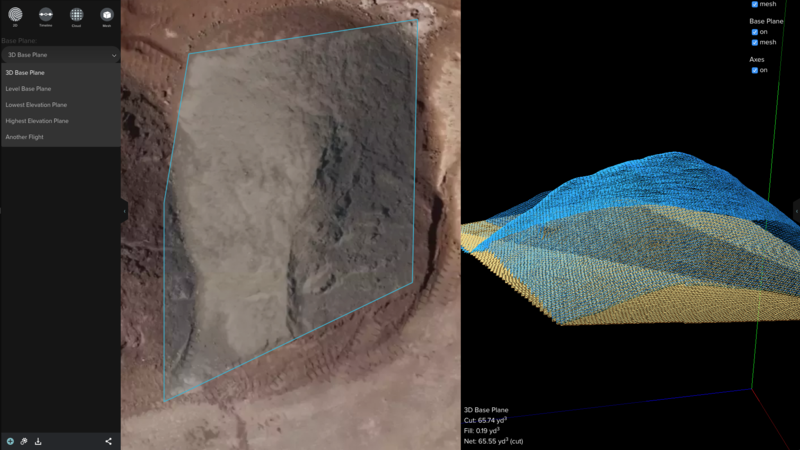 Point cloud (.rcs, .las): These are the two point cloud formats generated by Site Scan. .rcs is the Autodesk point cloud format. 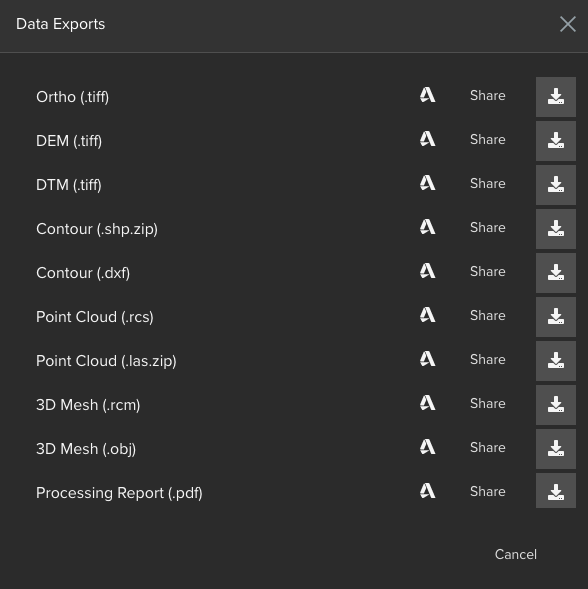 Open and edit in ReCap, Civil 3D, Infraworks, or any other Autodesk product. .las is the open point cloud format. Open in PointCloudViz or any CAD software, including Autodesk products. 3D Mesh (.rcm, .obj): These are the two mesh formats generated by Site Scan. 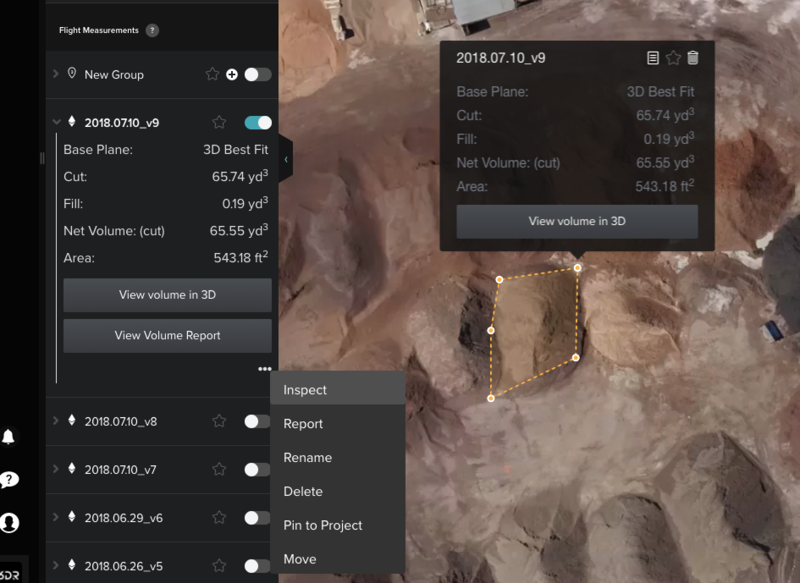 .rcm is the Autodesk ReMake native format, optimized for delightful viewing, flythrough videos, and simple volume measurements. .obj is the open mesh format shared across many platforms. PDF is a essentially a screenshot of the area you want to display. You can also display annotations, contours, and even toggle off the base map to avoid disclosing the location of the job site. 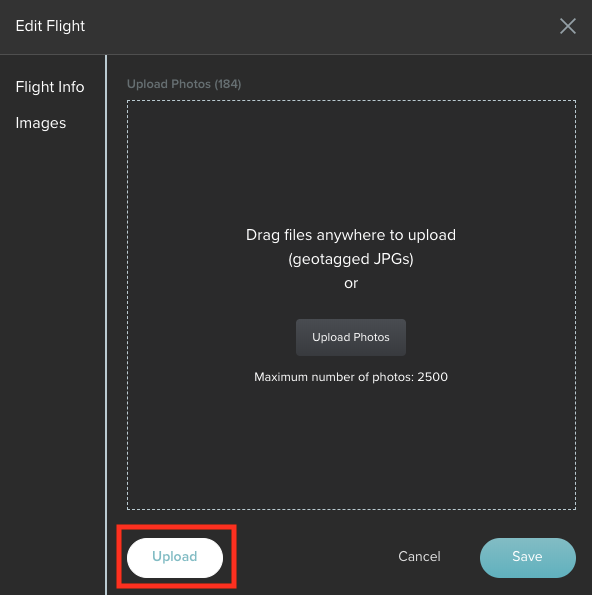 Photos will allow you to download all of the Flight photos you captured in a zip file. Contours are lines that connect locations of equal value in a raster dataset that represents continuous phenomena such as elevation, temperature, precipitation, pollution, or atmospheric pressure. The line features connect cells of a constant value in the input. Contour lines are often generally referred to as isolines but can also have specific terms depending on what is being measured. The distribution of the contour lines shows how values change across a surface. Where there is little change in a value, the lines are spaced farther apart. Where the values rise or fall rapidly, the lines are closer together. For more information on contour files you may visit the following article. 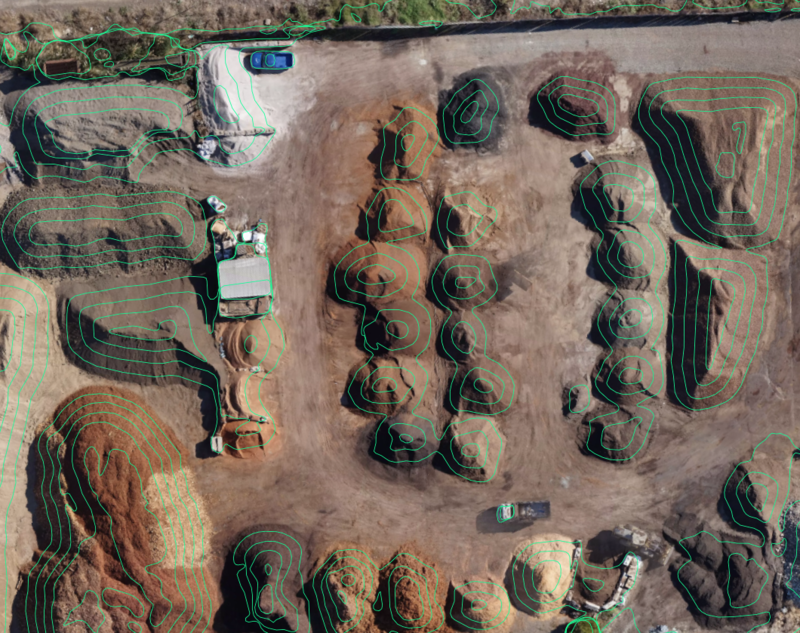 Site Scan allows you to create these contour files representing elevation directly from the Manager with out the need of any third party software. You can export these files in .shp format. To get them you first need to make sure the flight is processed. 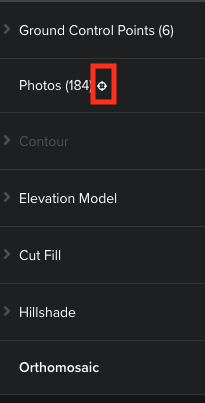 Next, within the Data Layers menu, you can use the slider to choose the contour interval. After clicking on Save, it will take a few minutes for the processing to finish, after which you’ll be able to display the contours and overlay them on the Orthomosaic. The Site Scan Manager has measuring tools you can use to calculate Distances, Areas and Volumes. 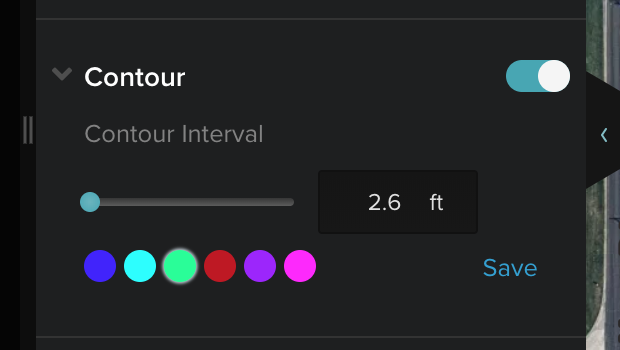 You can compare 2 Orthos from your Project by clicking on the “Timeline” option. Doing so will take you to the compare flights view. You have a timeline at the top, you can select which Flights you would like to compare at the top of the screen. Drag the slider in the middle to compare both sites. Make sure you zoom in enough so that the Orthos are displayed. Flights are sorted by most recent on both tabs. Start by choosing the Project that contains the Flights you want to combine. You can do so by clicking on the Projects button on the left navigator. 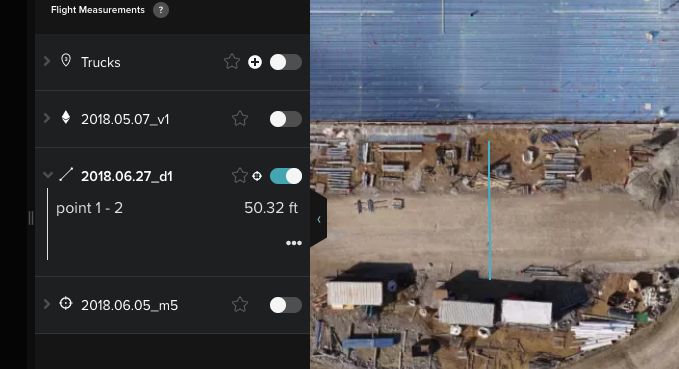 You want to make sure that they were flown in the same site under similar lighting conditions and elevation, or if you want to cover a larger area on a single output file, that the Flights overlap each other. 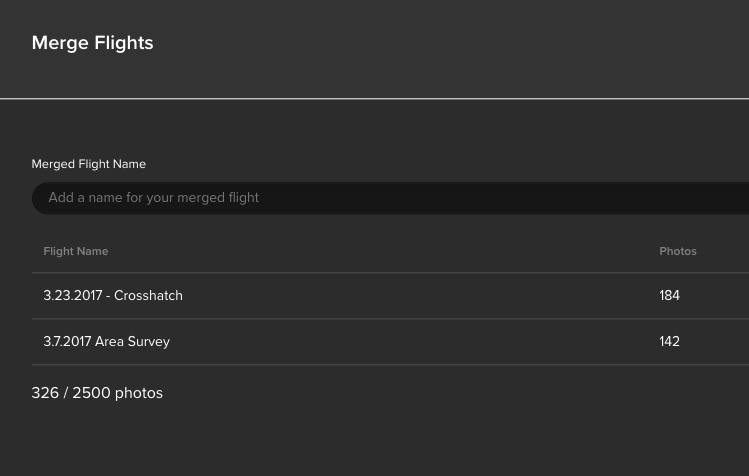 To access this feature simply click on the Merge Flights option on top. Click on it once so you can select which flights to merge. This will require you to name the resulting Flight from the Merge you’re about to perform. After you give it a name click “Merge”. As you select each Flight you will notice that the image counter at the bottom increases. Please make sure to stay within the 2,500 image limit. 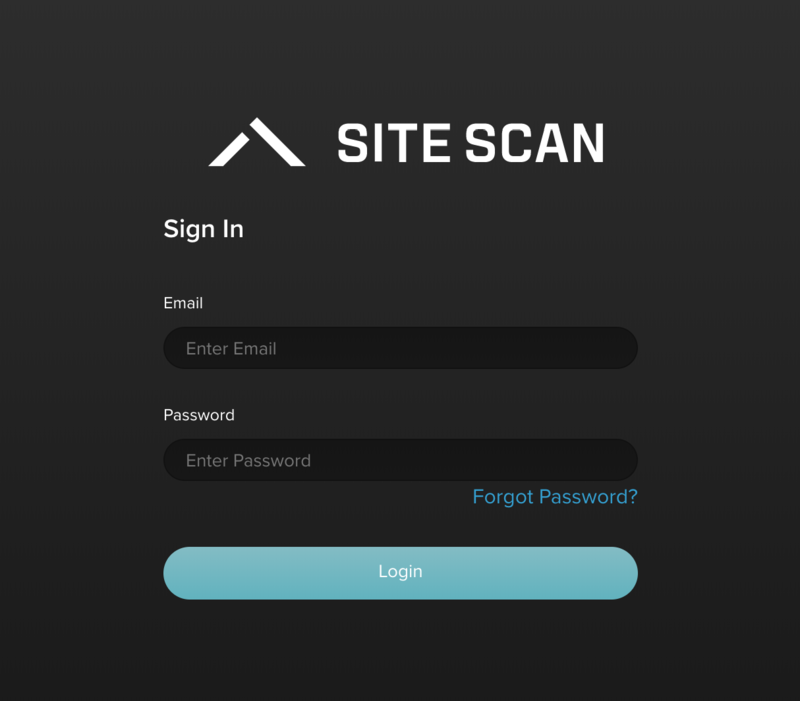 Site Scan Manager can provide you with a link that will allow you to share the base map with people who don’t have Site Scan, like a client for example. This link will take them to a basic map view of the flight that will also allow them to overlay the Ortho as well as any annotations you may have in that Flight. Clicking on the Share option in the bottom left corner will open a pop up, which will allow you to copy the link to share the map. 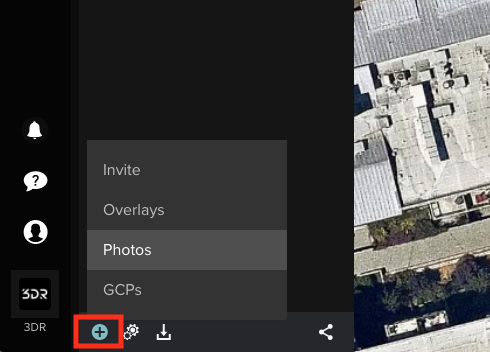 You can upload new images to an existing Flight simply by clicking the plus button on bottom left corner and then selecting “Photos”. This will bring up a new window. Here you can click on the “Upload” button, navigate to the folder containing the images you want to add, and after the upload process has finished, click on the “Save” button.